Discover water-oriented resort living the way it should be. 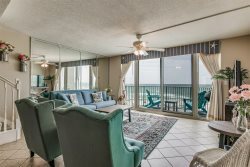 Sailmaker's Place combines the out-of-the-way unspoiled island charm of Perdido Key with modern vacation accommodations that you never dreamed possible. Located on the Intracoastal waterway, Sailmaker's Place has it all--zero entry swimming pool, beach, grilling areas and boat docks. The five-bedroom residences are modern, spacious and include a wet bar, two dining areas, and media room.